Wing clipping, if done properly, is a harmless method of preventing your chickens flying if they are predisposed to escaping an allotted area. It is used if they are likely to venture in to neighbouring areas where they are not welcome or it is dangerous. You will often find that larger breeds won’t need their wings clipped as their sheer size keeps them grounded so it’s generally the lighter, more flighty, breeds such as Leghorns and many of the hybrid varieties that are more likely to need a trim. However, you should weigh up the risks from predators if they are unable to fly and perhaps rethink your strategy if it puts them at an unnecessary disadvantage. Birds kept in an enclosed run will not need their wings clipped. Clipping works by unbalancing the chicken and for this reason you should only ever clip one wing – it’s not unheard of for a chicken with both wings clipped to generate enough lift to pop over the fence still. A job like this is best done when your birds are calm so spend some time relaxing them after being caught and before attempting to cut. You may find it easier with an assistant until you are more practiced but it is possible to do it solo especially if your chickens are used to being handled. When the bird is calm and securely held, spread the wing to make identification of the correct feathers easier. 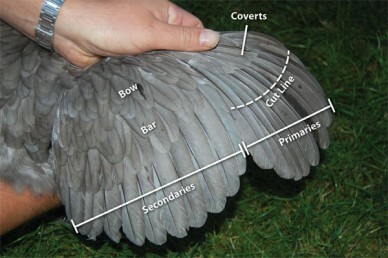 The ones to cut are the ten primary flight feathers (primaries) which are shown in the diagram. The trick is to cut the right amount. Too little and the bird will still be able to fly, too much and, if your bird has new feathers with a blood supply, it will make the bird bleed which is both painful and dangerous*. If in doubt check the underside of the wing where immature black shafted feathers or the blood supply in any newly formed feathers will be clearly visible. Luckily there is a built in guide in the form of the covert feathers. Follow the line of these removing at least half the length of the primary feathers, preferably slightly more (as shown in the diagram), and everything should be okay. Once the wing is tucked away you will hardly notice the difference between the clipped and unclipped wings. Remember that each time your chicken moults you will have to repeat the clipping process when the new feathers grow back. Clipped feathers can sometimes be a bit stubborn falling our during the moult so keep an eye out for any that might need a hand. *If you do accidentally cut a blood feather then you will need to act quickly as rapid blood loss can kill your bird. Firstly you will need to remove the remaining shaft from the follicle as the hollow tube will allow blood to drain out more quickly. You can do this simply with needle nose pliers. Hold the wing around at the area where the bleeding feather enters the birds flesh. Grip the feather’s shaft close to the follicle and gently but firmly pull straight out in the direction of growth. The follicle may still be bleeding at this point so stem the flow with a pinch of cornflour and then apply pressure directly to the area for about a minute or until the flow stops. Make sure that it has completely stopped and check regularly until you are sure it has healed. If in doubt get your bird to a specialist vet.